kiskeácity #LOF1804: Blogger Yon Ayisen: "I'm No Revolutionary Hero"
Blogger Yon Ayisen: "I'm No Revolutionary Hero"
Yon Ayisien blogs at Ayisyen Sa Nap Regle? and might as well be renamed HaitiPundit. He is the only Haiti-based Haitian blogger who blogs about politics and his blogging wit and vision is surprising for a 25 year-old. Though YA blogs in French, we chatted electronically in English a week before Friday's legislative runoff. Topics spanned haitian politics and internet, internet access in Haiti, day-to-day life and non-heros. AB: So Yon Ayisyen, you have asked to stay anonymous but what can you tell us about yourself? YA: Well, I can tell you that I'm 25, I'm Haitian, I've lived all my life in my country. I guess I'm well educated. I'm one of those who had the opportunity to learn French at home and then in a good school. I read quite a lot too. AB: Are you a university student in Haiti? 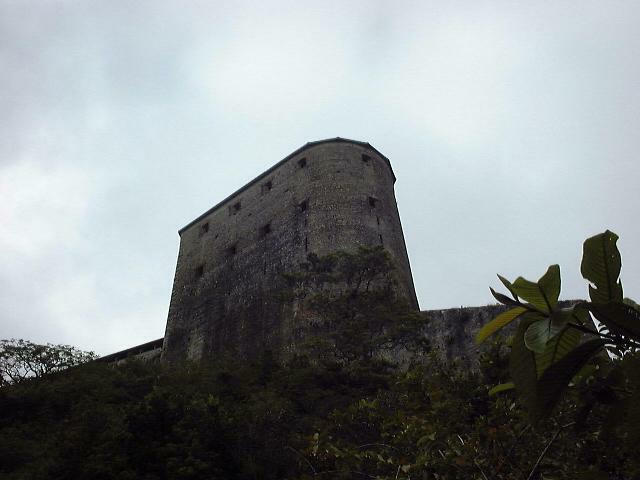 The Citadelle Laferriere built by Haitian Revolution hero Henri Christophe circa 1804 to prevent reannexation by the French. Courtesy Anders Brownworth. AB: Why did you start blogging? YA:I guess I usually have a lot to say, and I have an opinion on most things whether they have something to do with me or not. I discovered blogging while surfing the internet, it seemed like an amazing way to reach so many people. I thought I’d give it a try. I wanted to shed light on things that I think people don’t even realize. Things that are important or really terrible but that people here just don't care about. I'm not exactly a consistent blogger though. YA: Well it's hard times. Sometimes it's all the things I have to do, my job and obligations other times it's just that the things I could write are too depressing… Not to mention, I don't have an internet connection at home. AB: You’re one of three or four Haiti-based Haitian bloggers that I've found. For a while there was Haitian Mofo who blogged in both French and English but he stopped. Now there’s also Parlons Peu but he uses his blog mostly to publish his late father Marcel Salnave’s journalistic works from the 40s. So when it comes to blogging about current affairs you’re basically it. Why are you in such scarce company? YA: The first obvious reason would be that not too many Haitians are able to access the internet. But also people are not very educated and the educated ones are not necessarily used to going on the internet to write their ideas, they’re not so familiar with that concept. And, it's not only Haitians; most people are not familiar with blogging. Most Haitians have their thoughts and ideas on things, they share them with friends, family and that's it. They don't necessarily want everyone to know about their opinions, and of course when those opinions are about politics in this country they can be dangerous. AB: What are the reasons for poor internet access in Haiti? AB: Why do you blog anonymously? YA: Well..... I'm only 25.... and very few people who do know me know about my blogging. I talk about politics and I say out loud what I think about people and I know that’s dangerous in this country. I don't want to expose myself to unnecessary danger, or expose my family. I'm no revolutionary hero, just a regular person with opinions. AB: The D.R. of Congo under circumstances very similar to those in Haiti (UN mission, transition, elections, regular blackouts) have a relatively active blogosphere. How do you see the future of the Haitian blogosphere? YA: The Haitian blogosphere is nearly inexistent. I think the first step would be to actually have a decent number of Haitian bloggers who could represent the variety of voices in this country. I think people in the country have to worry so much about so many basic things that they haven't been blogging, at least not about politics. But I think we might see more personal blogs in the future. AB: What about those people who do have internet access like you and who do have the time and ability to blog? I know they're out there. There are plenty of Haitian websites and message boards for example (most in the diaspora) but some out of Haiti too dealing mostly with entertainment. Why websites but not blogs? YA: I think in Haiti 's case it's a matter of numbers. A blog is mostly about content, you need to have something to say. And it also tends to be something you do for free. People have to put time and energy aside to write things but it's just so the world could know. Not so many are willing to do that. AB: But have you visited the Haitian listserves lately? Corbett, Haitianpolitics, Windows on Haiti, etc...There are lots of Haitians on those listserves who clearly have something to say, mostly about politics. They are probably older than you are --in their mid 30s and 40s-- and many are also from the diaspora. But they're there and I wonder why even they who obviously have something to say are not blogging. YA: I guess blogging just doesn't come as a natural thing. Maybe they just need to know that they can blog. Maybe we should get the word out: "Haitian bloggers wanted". AB: So what's life like these days for a bright young 25 year old in Haiti? YA: Discouraging. Corruption, insecurity. Corruption is really a big problem. I know so many people who just left the country and so many others who are trying to. AB: Who reads your blog? YA: Most are people from the US. AB: What is the climate in Haiti now that the presidential election is over. Do you have any predictions? YA: It's a wait and see situation. Opponents, supporters of Preval, are waiting to see what is going to happen, everyone is hoping for a better future but.... I personally know a few people who got kidnapped recently so, there is still much insecurity. And also, for the legislative runoffs parties and candidates are trying to make alliances to win seats so some ugly "maneuvering" is going on behind the scenes. AB: What is at stake in the legislative runoff? YA: A lot. Especially when you consider that the last time Preval was president, he had a parliament who opposed him and he just could not nominate a prime minister they would accept. So if he does not get the majority in the parliament, he will not be able to have a government that is truly his because the parliament votes the prime minister in.